Here lyes ye Remains of Mr. This stone was probably carved by Robert Fowle in about 1772 while he was a journeyman in the shop of Joseph Lamson II (and also Joseph's cousin John Lamson) in Charlestown. 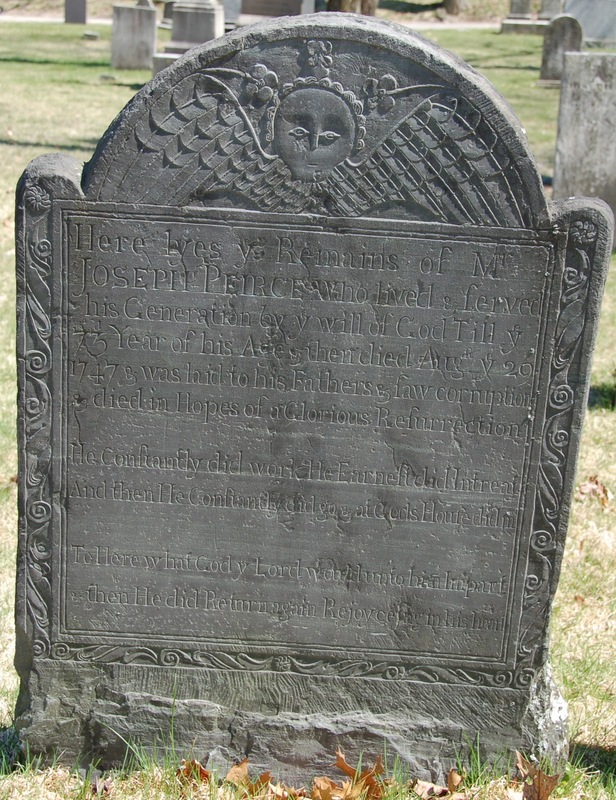 Fowle copied Joseph's curly-hair cherub here, but I think John Lamson lettered this stone. Both Joseph and John had their shops and homes (which were at Charlestown "neck") destroyed by the fire at Bunker Hill. John took refuge at Woburn, where he died in 1776. Joseph, I believe, went up to Newburyport in 1775 and used his former employee Robert Fowle's stonecutting shop there while Fowle himself was in the army. (Fowle had left Charlestown in 1772 to establish himself as a stonecutter in Newburyport). After Joseph died in 1789, Fowle returned to Boston and went into a partnership with John Lamson's orphaned son Caleb Lamson II; they no doubt used Joseph's new shop, rebuilt a few years earlier. This brought their relationship full circle -- an interesting account of yet another family affected by those turbulent times. That word is probably "earnest" rather than "earned."